Dublin’s returns don’t look too bad – scoring 2 – 09 from an Expected return of 17.30. Those two goals however came from non shots (yes they created the chances but from an Expt Pts vantage they don’t count as they didn’t come from a Dublin shot on goal) meaning that Dublin’s actual shots returned more than 8 points below Expected and showed a Conversion Rate of 29%. In their five games this year Dublin were showing a 61% Conversion Rate and a combined Expt Pts value of +11.21. In the 23 other Championship games since 2013 Dublin’s Conversion Rate has only dropped below 40% once – and that was a 39% against the ultra-defensive Westmeath in the 2015 Leinster final. The next lowest after that is 44%. This was a spectacular derailing of the well-oiled machine. How did it happen? 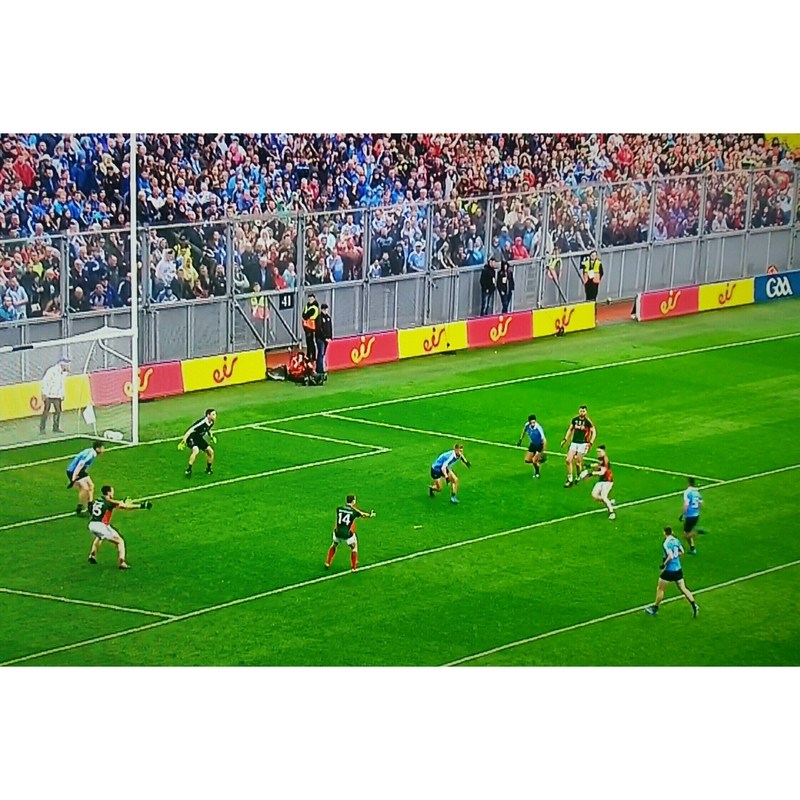 Dublin had three goal attempts in two different sequences (Brogan’s shot after Fenton’s original chance was saved as well as Fenton’s second attempt) which produced one goal – but the goal did not come from any of the three Dublin shots. As such the Expt Pts on the three shots was -3.42 (even though Dublin did get 3 points from the scramble – God the Expt Pts model really doesn’t like own goals!). Note that for the second goal there was no actual goal shot – Rock spilled Connolly’s (wondrous) pass before Boyle put his foot through it. Just on those two Fenton goal attempts – they were eerily similar with four different Mayo players committing the same basic “lack of communication” mistake. In the first Mayo are basically set with S O’Shea (8) on Fenton (8). Fenton lays the ball off to the wrap around player and drifts towards goal however both O’Shea and Higgins (4) then go towards the player with the ball. Neither goes with Fenton. Same again for the second. This time replace McLoughlin (10) for O’Shea and Durcan (7) for Higgins. Fenton lays the ball off to the wraparound runner and continues to drift towards goal. Both Mayo players get sucked to the ball leaving Fenton acres of room in behind. Unfortunately there is just no hiding from the fact that Rock had a bad day. He scored 0 – 03 from seven attempts for an Expt Pts tally of -1.57. Much had been made of his 93% success rate this year coming in to the game (0-37 from 40 shots with an Expt pts of +7.98 from frees and 45s) however it must be remembered that he was also on 93% coming in to the 2015 semi-finals. From there on he only converted 0 – 02 from 5 attempts in the two 2015 games against Mayo and only attempted two of Dublin’s nine deadballs in the final against Kerry. Then we have Connolly’s sideline attempt. Up until the start of this year’s Championship 18 point attempts from a sideline had been charted with a combined 28% Success Rate. Connolly is a better player than the majority, if not all, of those players who had taken those 18 attempts however (a) he is not the free taker and (b) those 18 were probably taken in better conditions and not in the 74th minute of a pulsating All Ireland final. It was a punt but he was always more likely to give the ball to Mayo having missed than having scored. That leaves 20 point attempts throughout the game which saw Dublin convert 30% (0 – 06) with an Expt Pts tally of -3.03. Granted the conditions were not great but that is just very, very poor. 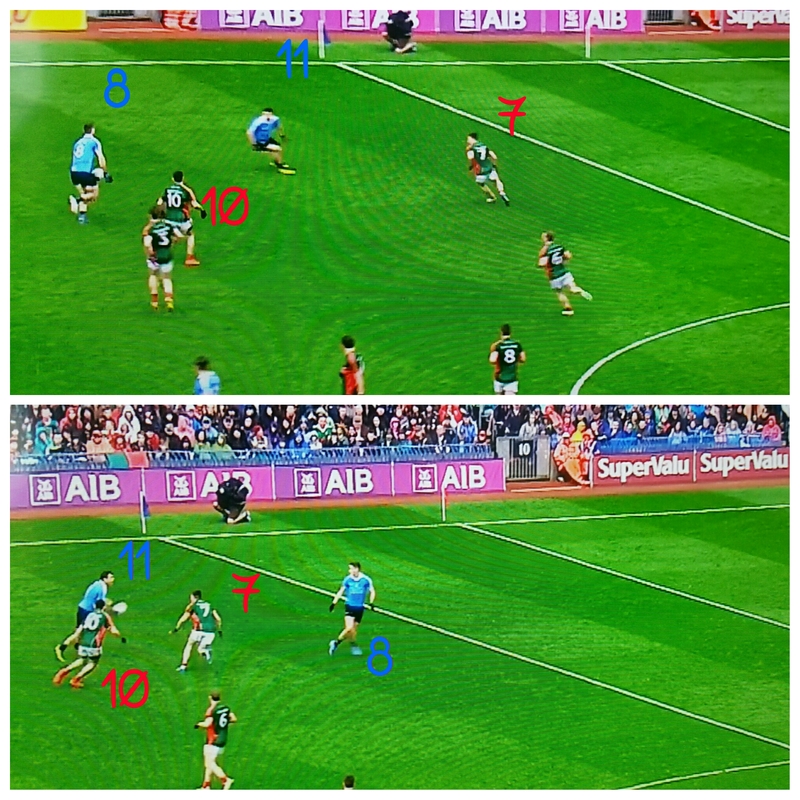 And it was not confined to a handful of individuals having a day off – 12 separate Dublin players had a point attempt. There was just no sign of this. 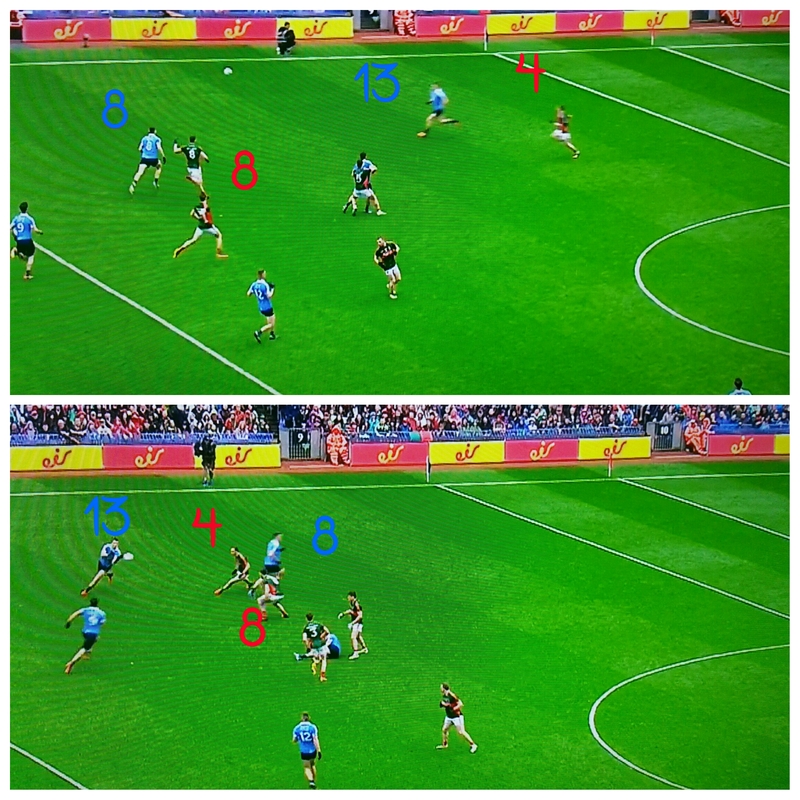 As can be seen Mayo were very good at applying intense pressure to 45% of Dublin’s point attempts. We don’t have any other comparison point for this but Dublin only applied a similar amount of pressure to 11% of Mayo’s shots. It is no fluke that Dublin struggled – but it is strange that they struggled so much. There was a split second where O’Connor was free on the square and when I put the still up on Twitter there was a split opinion on whether the ball needed to be fisted across. Personally the picture makes a fisted pass look a lot easier than real time did – it would have to have been spot on – and I would want Moran having the confidence to take that shot on. Mayo were slightly above average with a Conversion Rate of 50% (0-09 from 18 shots) and an Expt Pts of +1.07. Much like Dublin there was a large spread of shooters with ten different players having a shot. O’Connor & Vaughan showed well here scoring 0 – 02 from three attempts each but the overall spread means that no one really stood out. Again like Dublin however there were some wild efforts in there – not sure either O’Shea should be taking pot shots outside the 45! Immediately after the game concluded the thought had been that O’Connor’s deadball day had been spectacular. That however was more in comparison to Rock than anything else. O’Connor converted 86% (0 – 05 from 6 shots) with an Expt Pts was +0.41. A good day’s return on the numbers; nothing more. However when looking at that stat line we need to take into account the context of the game. If Rock has question marks about him on the big day then O’Connor is the exact opposite – he thrives on it. In eight All Ireland finals and semi-finals since 2013 O’Connor is 81% on frees and 45s (0 – 09 from 48 attempts) with an Expt Pts tally of +2.44. When everything is to play for O’Connor delivers well above average. Dublin won 18 of their 22 but only managed 0-01, or 0.06 points per kickout won, from those 18 wins. In the 2016 Championship to date that was 0.51 points per kickout won. Another one to chalk down for the Mayo defence. Another minor victory can be noted in the time it took Cluxton to get his kicks off. A lot had been made in the build up to the match as to how Cluxton looked to get his kickouts taken within six seconds. 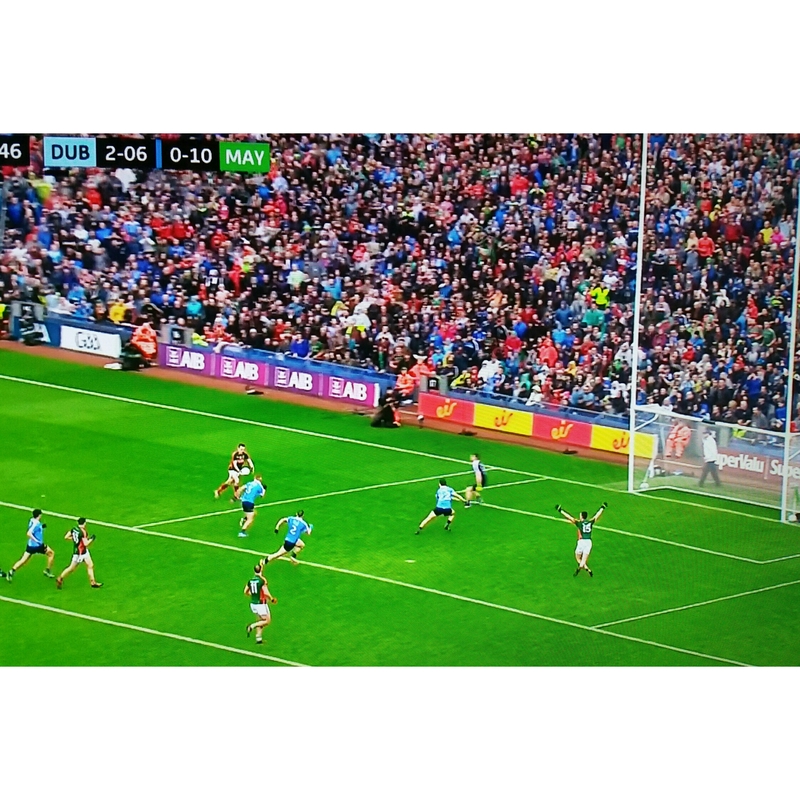 We didn’t see a number of the kickouts but when we did Cluxton was regularly taking over 15 seconds to kick the ball out (the first few were indicative; – stalled as had to be retaken, 15 second wait, 16 seconds, didn’t see on TV coverage, 12 seconds, 14 seconds, delayed for the black card, 20 seconds). Mayo were, score wise, better racking up 0 – 04 on the 16 kickouts they won – 0.25 points per kickout – however they also coughed up 0 – 02 and nearly had a calamitous last few minutes when Clarke hit three poor kickouts in quick succession. The first was lofted to Parsons on the 45m line on the right wing allowing Mannion to break the ball to O’Gara forcing Barrett to give away a free that Rock pointed. On the resultant kickout Clarke managed to pick out Connolly short left who took one look and pointed. Clarke then placed Higgins under all sorts of trouble when he went short right. Up until those three kickouts Mayo had taken 17 winning 14 – however when they went past the 45 they had lost three out of four. Given this, and the sequence above, it will be interesting to see if Dublin push up the next day putting Clarke under pressure and forcing him to go longer. This entry was posted on September 20, 2016 at 17:05 and is filed under 2016, Championship. You can follow any responses to this entry through the RSS 2.0 feed. You can leave a response, or trackback from your own site.